When I first joined IHI’s Conversation Project (TCP) team as a project coordinator, I thought I had a firm grasp of its mission: to ensure that everyone, everywhere expresses their end-of-life care wishes with their loved ones and health care providers to increase the likelihood of getting the care that matters most at the end of our lives. It seemed straightforward. Little did I know that, as time progressed, I would be confronted with multiple dimensions of the end-of-life care discourse because of my identity as a black woman. Upon joining the team, I was asked to attend a three-part end-of-life planning series at a church in Jamaica Plain, Massachusetts. The program helps people think about their values and end-of-life wishes in a faith setting. Each session prompted participants to reflect on how they would want to live at the end of their lives and what they would want their loved ones to know. This church used TCP’s Conversation Starter Kit to lead their sessions. Though I was new to the team, I understood that only through intimately engaging with our resources would I be able to understand firsthand the depth of the Conversation Project movement. I was eager to take part. So, why, when I arrived at the first session, were my hands trembling? Why did I have a small lump in my throat threatening to make itself known through a tear? I attended all three sessions and during each one, while my belly reminded me of my deep discomfort, my mind gave no explanation as to why I felt almost offended by the topic we were discussing. Within the first year of joining TCP, mainstream media articles and research papers were published about the astronomically high maternal mortality rates among black women in the United States. As a black woman, I was shaken by these findings but — as I do with most statistical information I read — I internalized it as something abstract. I subconsciously refused to believe that these statistics would ever have anything to do with me or anyone I loved. But then it proved itself to be my family’s reality. 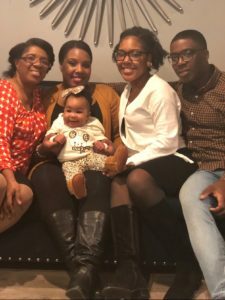 In April of 2018, my thirty-year-old older sister gave birth to my niece. I became an aunt! My niece came into the world perfectly healthy and perfectly beautiful. 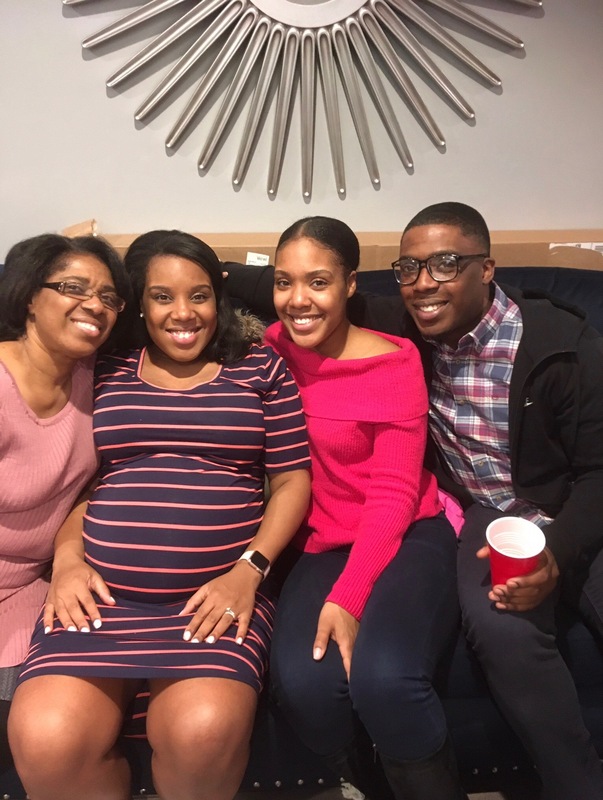 As my family and I giddily sat in the waiting room after my sister’s C-section, we were taken aback when we were informed that — rather than staying on the maternity floor with her newborn — my sister was being transferred to the intensive care unit. Immediately, all the articles I had read months prior came pouring into my mind. For a week, my sister’s health deteriorated drastically and quickly. She was put into an induced coma and my family was told that her chances of survival were slim. Among the many memories I carry with me from this time is my sister calling me before going into delivery. “I’ve read the statistics. I know the truth. I don’t want to die,” she said. “You’re not going to die,” I reassured her, though I also knew the truth and had a pang of fear in my own belly. Looking back, the trembling hands and the lump in my throat in the church in Jamaica Plain all make sense now because I, like my sister, am a black woman. The reality is that I have a lower life expectancy than my white counterparts. So, when I am asked to talk about dying, I don’t think of it as an event that will happen in my old age. I think about it as soon, as imminent. The tremble, the lump are visceral responses to my full understanding of what it means to live (and die) in the intersection of being black and a woman. Today, my sister is alive and well. Her (very) close encounter with death has deeply informed the way I approach TCP’s notion of ensuring that everyone, everywhere expresses their end-of-life wishes because “everyone” includes people whose experiences with death are complicated by a plethora of inequities, including a lack of access to quality health care, physician biases, and historical disenfranchisement within the health care system. While we all eventually come to “the end,” how we arrive at our final destination varies greatly depending on the different identities we embody. How do you even begin to express your end-of-life wishes when the first thing you ever wished for is a better shot at life? I don’t have an answer. I simply have a story that’s a testament to the fact that TCP’s mission is not as simple as I once thought. To say, “This is how I want to live at the end of my life” and for those wishes to be honored in its fullness is a great privilege — a privilege many people don’t have. But I believe we’re here to help change that. Wow. This is a powerful story; thank you for sharing it. I myself am a white woman, and past my childbearing years, but I teach a public health undergraduate course at a state university, and have a very diverse group of students (mostly female). We do talk about this particular disparity, and it hits close to home for a number of my students, too. Your story brings this very real concern to life for me – and the photos are wonderful! I really appreciate seeing your comments. I’m responding because I do training on advance directives using Powerpoints from the Maryland Office of Health Care Quality. I’ve done presentations for undergraduates at UMBC, and if it would fit with your courses, I’d be glad to talk about possibilities. Wow, thank you for sharing this and starting the difficult conversation that we all need to plan for. Thank you for your transparency. Really meaningful writing. It causes me to think of the many different, but related, things that people deal with in talking about their end-of-life preferences. My mom died December 25, 2018 as a result of 6+ years of Alzheimer’s disease. As an only child I am so grateful that she had written her medical directive and I did not have to make any decisions but only to carry out her End of life wishes. Especially since she has nine surviving siblings. That was truly a gift of love that she left me and I encourage anyone and everyone to leave that gift of love for those they love. Yes, Naomi, I understand your story and experience. It is at a “deeper level” that end of life information needs to be dispersed. But what if you don’t know all that information. We want people to make wisest and best choices for their life and they need to have ALL the knowledge and access to do so. What a poignant recount of what I can only imagine was an unequivocally terrifying time. As a doula who has held space at the bookends, I aspire to provide personalized, meaningful care to each client, so becoming better informed is key. Thanks for sharing. The race is very important which is important for all participants who participate and everyone hopes for the most successful outcome for him. Alicia Garza spoke at EndWell 2018 in San Francisco last December and that was my aha epiphany to this gap of which you speak so eloquently. I work primarily with the elderly, many of whom are living with dementia, but your points ring true; no one is guaranteed tomorrow, and some folks are more aware of that than others. We all need to be influencing The Conversation, your story is perfect motivation. Thank you for sharing.